The Flying Mantis is hand built, custom painted, high specification, leading edge designed, fast and fun. Cross beam join appears seamless. Elliptical carbon 2-part Selden mast. 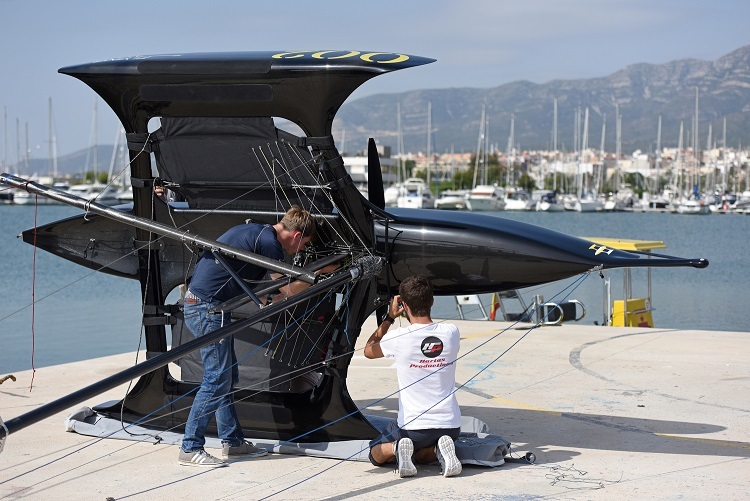 Daggerboard and lift-up rudder (DBS version) plus rudder and central T-foils (Foiling). All lifting and epoxy sandwich construction. Central T-foil adjusted by wand control system from bowsprit. Twist grip tiller to adjust rudder foil angle of attack.